BRIEF CAMP DESCRIPTION: Camp Unbeatables is an award-winning unique program that combines life skills training with sports, artistic, creative and educational activities. We offer hands-on learning to have your child be successful now and in the future. 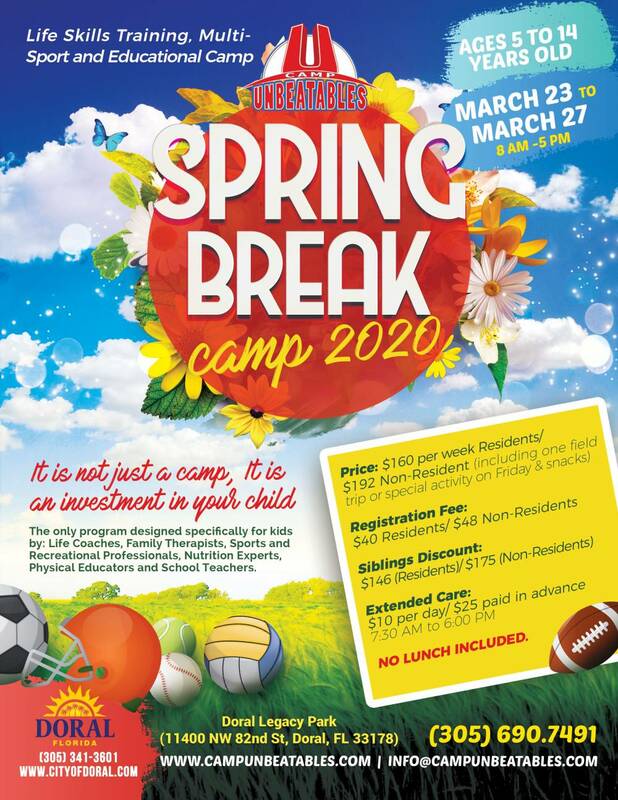 Spring Break Camp 2018 from March 26 to March 30. CAMP LOCATION: The camp at Doral is located a block east to Turnpike. Very convenient for parents that live in Hialeah, Miami Springs, Miami Gardens, Miramar, Weston, etc that work in Miami and need to take Turnpike South. Doral Legacy Park is one of the best and biggest sports complex in South Florida. Please, visit our website for lots of camp photos and videos. CAMP FACILITIES: Doral Legacy Park has amazing facilities. A College type indoor basketball and multi use gym; different classrooms to keep our campers easily separated by age groups, a professional auditorium for our morning virtual presentations, outdoor basketball courts for little and older ones, a splash pad for the campers to cool off during summer time, football, baseball, tennis, track and field courts and much more! CAMP PROGRAM INFO: Camp Unbeatables is the only Life Skills Training and Multi sports summer program in USA, created especially for children ages 5 to 14. We have a perfect combination between sports and fun activities with education in the 6 most important areas of the children's life: fitness and nutrition, social environment, family life, school success, interest exploration and emotional life. Our campers end their summer well equipped with : 1) effective tools to manage the most common situations that they may confront at their age 2) instruction and practice in the most popular and likable sports and 3) Having had lots of fun doing the most innovative camp activities. We have an impeccable trajectory of 12 years, and on 2013 we were awarded as the Educational Program of the Year by the Minority Chamber of Commerce of USA. Our staff members are selected through carefully handled interviews in where we meet with the potential staff member and get to know them as an individual. Our qualifications for members differ depending on the job positions. Supervisors, Counselors, and Volunteers each have their own list of qualifications they must fulfill. In order to be part of our camp, all our staff goes through National recognized certifications, second-degree background checks and a very comprehensive training. CAMP LEADERSHIP CIT/LIT PROGRAMS: We have the only Life Skills Training in USA especially created for children 5 to 14 years old. We offer leadership and public speaking training to the group of age of 12 to 14 and the volunteers that work at the camp. FAMILY CAMP SESSION(S): As a part of our Unique Life Skills Training Camp Program, on weekly basis, we send parents information for them to continue reinforcing at home the information we offer to the children at the camp. YEAR-ROUND PROGRAMS: Starting April 28, 2018, we will be offering The Unbeatables Saturdays. A day camp program that will allow parents to drop off their kids on Saturdays and do errands, hobbies or just relax, things that they cannot normally do because they have their children. The camp goes from 8:00 a.m. to 5:00 p.m.
Summer Camp info available soon! Go to The Best Florida Summer Camps Directory to Find More Top Summer Camps Near Doral, Florida.